OBAMA’S CLIMATE WILL SURVIVE EVEN IF A REPUBLICAN IS ELECTED, SAYS EPA CHIEF | "Global Possibilities"
Barack Obama’s main weapon in fighting climate change will survive even if Republicans win the White House in 2016, a key member of his administration said on Tuesday. 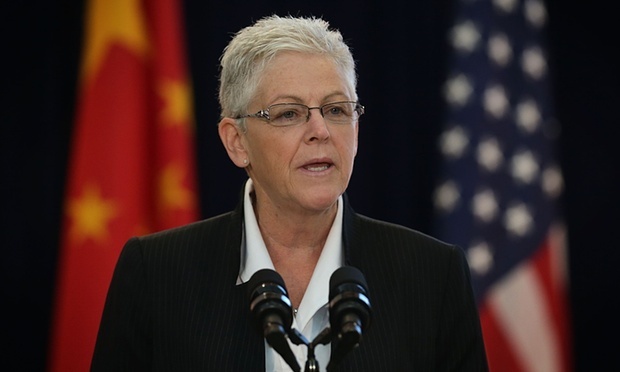 Gina McCarthy, who heads the Environmental Protection Agency, said the carbon pollution rules that are the main pillar of Obama’s climate plan would go ahead as planned despite a “disappointing” supreme court ruling last week against another EPA rule for mercury and other toxins, and attacks on the agency’s authority from Republican-led states. Nor could the carbon pollution rules be easily set aside once Obama leaves the White House, McCarthy told a talk hosted by the Christian Science Monitor. She said the rules putting the first carbon pollution limits on power plants, due to be finalised this summer, could not be slow-walked if a Republican wins the White House. In a week when the EPA authority and budget is due to come under multiple attacks by a Republican-controlled Congress, McCarthy was careful to project confidence in Obama’s climate change legacy despite recent setbacks. Obama’s ability to safeguard his climate legacy once he leaves the White House is seen as critical to the chances of reaching a strong deal on climate change in Paris at the end of the year. The US supreme court ruled last week that the EPA did not fully take costs to industry into account when it set limits on emissions of mercury, arsenic and other heavy metals from power plants in 2011. Meanwhile, Oklahoma last week filed a lawsuit to block the EPA rules. At least two other states, Wisconsin and Indiana, have said they will not comply with the regulations. McCarthy, however, insisted she was confident that the supreme court ruling – a victory for industry and Republican-led states that had opposed air pollution controls – would not derail the EPA’s plans of limiting carbon dioxide emissions from the country’s power plants.